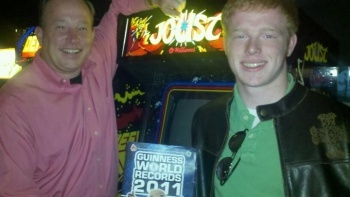 Steve Sanders, a pioneering competitive gamer who appeared in the film The King of Kong: A Fistful of Quarters, paired up with his 17-year-old son Isaiah to set a world record high score in two-player Joust. The holidays are a great opportunity for father-son activities, like putting up the Christmas tree, going tobogganing or maybe setting a new world record score on a classic arcade stand-up. That's what Sanders and son did on December 11 at Richie Knuckles Arcade Machines in New Jersey, ringing up 745,000 points in two-player team Joust, crushing the previous mark of 600,750. That score was actually set back in 2006 by Sanders and Donald Hayes, currently the world's top-ranked Joust player. "When I was his age, I was getting into the record books and remember how it felt," the elder Sanders told Denton Arcade Game Examiner. "I felt like I could do anything. I felt like I was on top of the world." Sanders was a little hesitant about his son getting involved in gaming when he was younger. "He didn't like us to play videogames too much," Isaiah said. "He feared we'd end up just like him." But when Sanders' wife Nancy purchased a joystick for his PC around the same time King of Kong was being made, he apparently decided it was time to bring his son into the family business and started teaching him how to play Joust. When the decision was made to take a run at the record, Knucklez (yes, that's really his name) went out and purchased what was needed to make it happen since he didn't have a Joust machine at his arcade. "It was really cool. It was wonderful to see," he said. "I'm lucky to be able to call Steve Sanders a good friend." Sanders said he and his son aren't ready to walk away from Joust just yet; they hope to take a run at the one million mark sometime in 2011. "There's nothing like doing something noteworthy as father and son," he said.